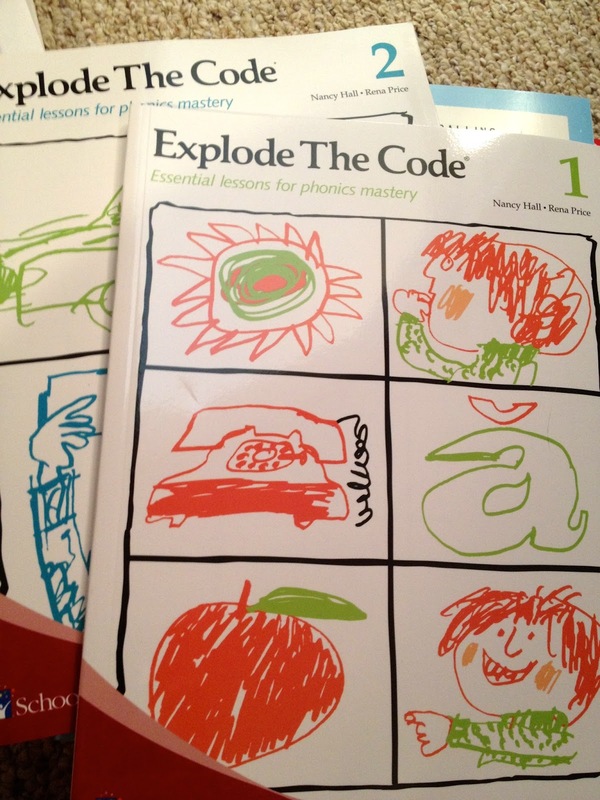 This is my last week teaching Literacy Launchpad in my beloved preschools... at least for a while. Can you guess why? That's right, we're becoming a homeschooling family. 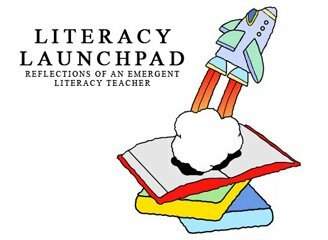 I'm entering a whole new realm of Literacy Launchpad-ness! It's not done, folks! I will be reading and reading and teaching and encouraging with my own three at home, and sharing with you all along the way! I also plan to continue visiting my schools for some special story times every few months. I wish I could put on the homeschool mom hat without having to take off another hat that I currently wear, but I am no super woman. And if I'm going to do this homeschool thing, I want to make sure I can give it my all for my kids. We might try this homeschool thing and find it to be a no-go, but we're at least going to try. I'm excited and hopeful that it will be a really good thing for all of us. If you are a homeschooling family I would love to hear your #1 homeschooling tips! And you will still find me here, sharing ideas, tips, project ideas, and book suggestions! This summer has been going by so fast. It's been pretty crazy, and feels a bit like a blur. We've been visiting our library in the midst of the chaos though and continuing to read. Here are a few snapshots I captured in some of those quiet, still moments. O.K. this moment wasn't so quiet, but it was at least pretty still. We had some of our cousins staying with us and did Madlibs as bedtime stories. 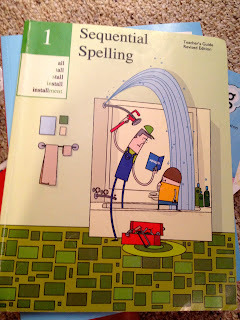 My kids love Madlibs and are really good at telling you what a noun, or verb, or adjective is. 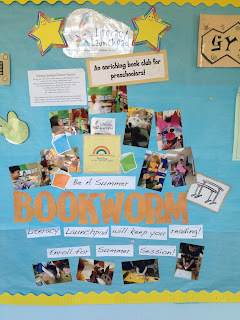 This one's not necessarily a reading moment, but I wanted to share my cute little bulletin board I posted at my schools for our summer reading! Did you know some LEGO sets come with little comic books? So fun! The kids wanted to share some of their photo books they made with their aunt and cousin that were visiting. They felt so proud as she sat with them and each of their books aloud. We got the kids' cousin hooked on reading in bed with a night light while she was here visiting. So fun! We visited a used bookstore and my sister grabbed some Shakespeare and challenged Mel to read some of it aloud. Here's him trying. Ha! Ever play one of those story-making games with you kids? You know, the ones where you take turns drawing a card with a random picture or word on it? Each person has to use what's on the card they drew to add onto the story. It can get pretty silly. We have a couple versions at our house, and the kids really enjoy them. We giggle lots when we play. A couple weeks ago I gave my boys cameras to use, and let them go wild taking photos that we could make into our own, personalized storytelling game. I had to give them ideas of what kinds of things to photograph to get them going. The photos we ended up with were still rather interesting, but the whole point was that it was their personal game, so I tried to stay pretty hands off with their photo taking. And honestly, the sillier the pictures, the more fun the game is. I printed the photos at our local drug store and the boys were so excited to give our version a try! We didn't mount our photographs on paper or label then or anything (I'm lazy), but you could, of course. We just used the photos themselves as the cards. We put them in a pile face down and took turns drawing. There was lots of laughing, and we ended up with a pretty crazy story. Give the kids a specific theme of items to photograph for the game - an items for every letter of the alphabet or something like that. You could give them some guidance in what they photograph by sending them on a list with specifics on a variety of objects you want them to find and photograph, kind of like a scavenger hunt (something fuzzy, something bigger than yourself, something that makes noise, etc). It would be fun to see how the items compare to one another, if you have more than one child photographing. If there are two children playing, you could have them take their photos separate from one another and let them be surprised by what the other ends up taking photos of. Let the photos be revealed to each other as they play the game! 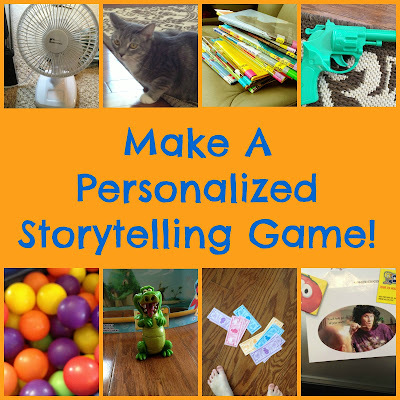 Adding labels to your homemade photos/cards would add literacy value to your game. Or if you want your kids to practice reading some specific words, you could put some text only cards in your deck with those words on it, and using those words in this fun storytelling game might help your child become more familiar with the word and more fluent in reading it. 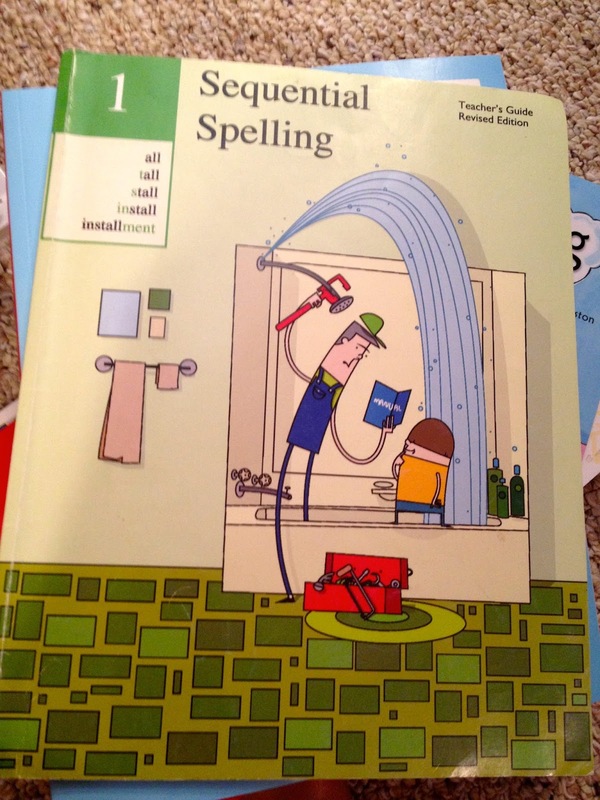 Your child's spelling words might work well too (obviously, nouns are the kind of words that work best in this game)! Remember, narrative skills are a key pre reading skill needed to move into being a successful reader. This game is a great narrative skill builder! Try it out. Play it with friends, play it at dinner... Laughing together bonds people together. So what could be better than giggling together and having fun over some great, meaningful literacy practice? Summer never feels like a time when things slow down and life is a little less crazy. Our summers are busy, for the kids and for me. When I see these book lists on Pinterest titled things like "10 Best Beach Reads," I laugh. What mom is able to actually read at the beach (If you are a mom that does get to read at the beach, please don't tell me, or I might cry)? I'm always busy making sure my kids don't get pulled out to sea by a rip current. ... Or I'm burying kids in the sand! Not only does extra reading hardly ever seem to happen, but I struggle to maintain the little bits of regular reading time we normally observe. Travel and late bedtimes mean we sometimes miss our bedtime stories. My Little Reader hasn't done much napping this summer and I only just realized today that no nap means we haven't been reading our normal pre-nap stories. My kids love to stay up and read with their book lights at night, and even that has been falling by the wayside as they are so often zonking out as soon as they hit the pillow, as of late. When there are lulls in their days and they get bored, I have seen my kiddos pick up books and read... from time to time. 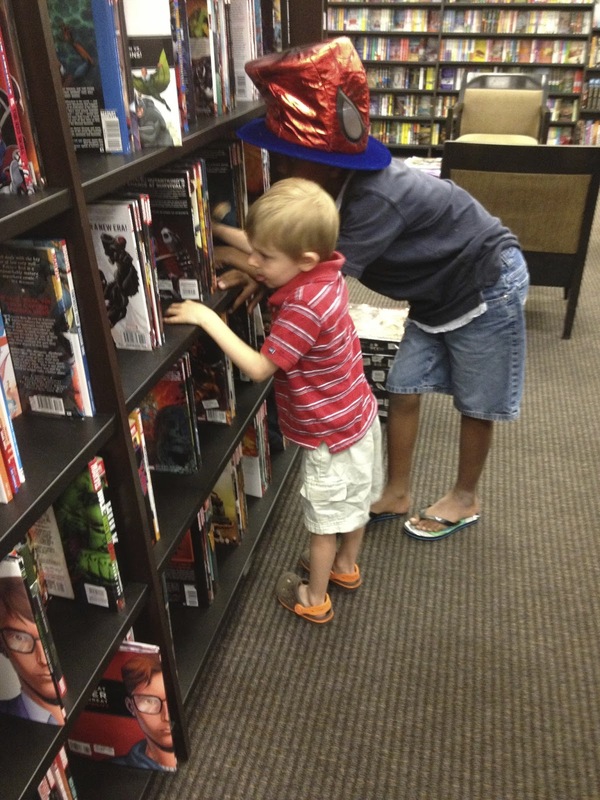 They begged to do the summer reading program at the library, and have happily been picking out books that interest them on our regular trips. They are slowly learning to read for the pure pleasure of it. So all is not lost. But as we creep toward the start of another school year, and I look toward days containing some kind of routine again, I realize that I need to really be intentional with our reading times. I need to guard our established reading routines, perhaps reinstate some that have been lost, and I hope to work more reading time into our routine wherever I can. 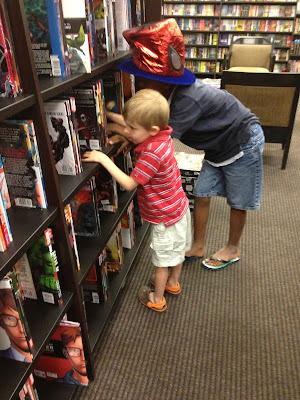 We will be homeschooling in the fall, so I'm excited about getting creative with how we find time to read, and simply having the control over our routine to give reading the prioritization that I crave. Finding space for reading turns our to be easier said than done, even for those of us that understand its value and enjoy books. 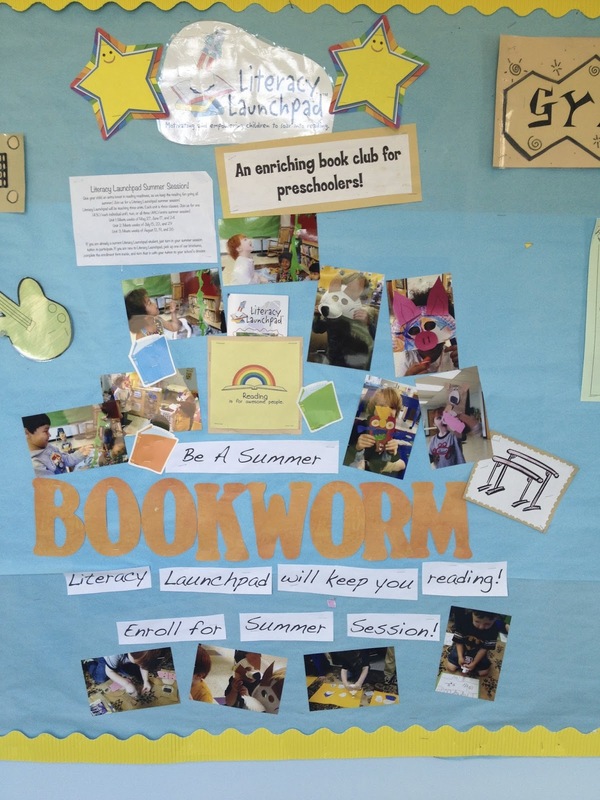 So how to you find space to read in the craziness and busyness of summer? Our bedroom floors are always covered in books, so we've at least got that going for us! We have a wonderful armoire that we got from a yard sale. 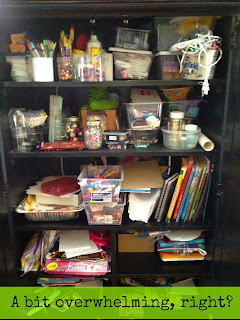 My husband added some additional shelving to the inside, and now we use it to neatly house all the wonderful art and craft supplies that help nurture my kids' creativity. 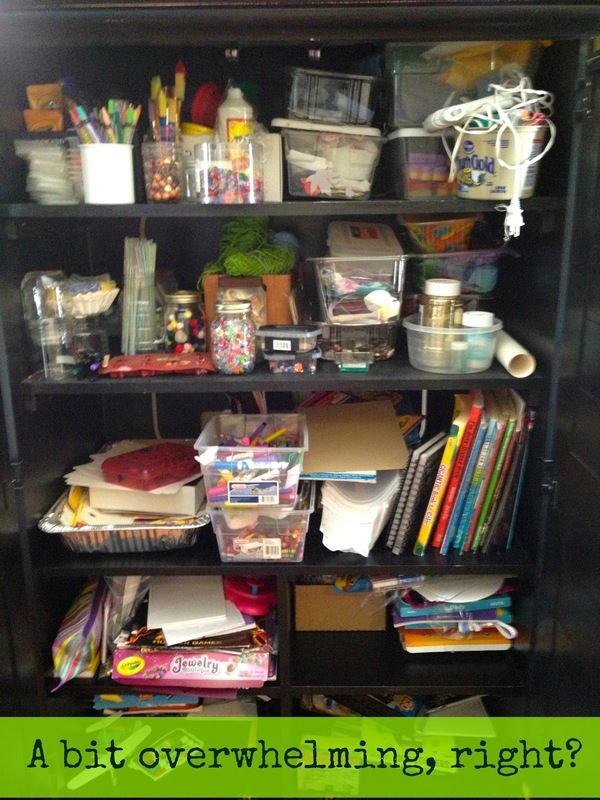 My kids often struggle to find basic supplies like scissors, glue, and crayons (despite my numerous and varied attempts to organize this cabinet). I'm always having to help them dig, or sometimes they just don't even bother trying and give up on crafting for a different activity. Several months ago I bought a magnet board really cheap at IKEA. What I had planned to use it for didn't work out. 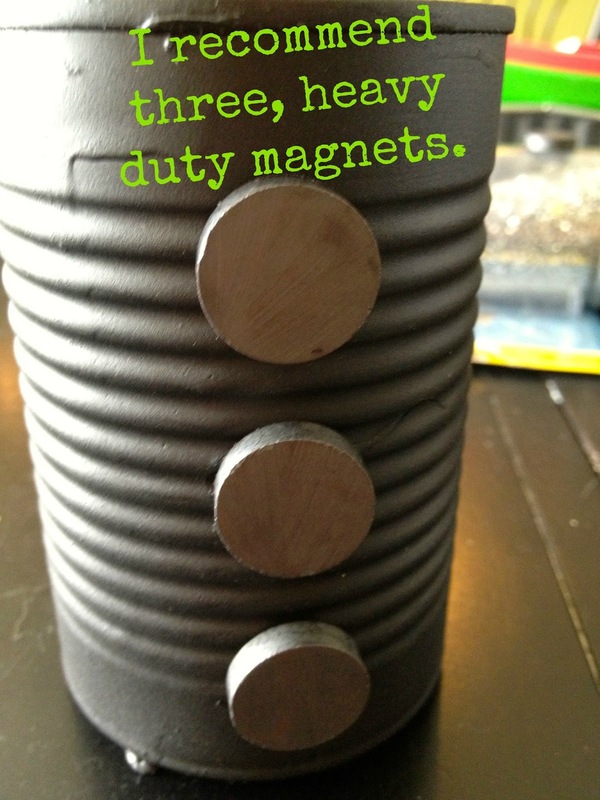 Then I saw an idea on Pinterest for spray painting aluminum cans and storing crayons and markers and such in them. My wheels started turning and I figured I could add magnets to the cans, and stick them to this magnet board that I didn't really have a use for anymore. 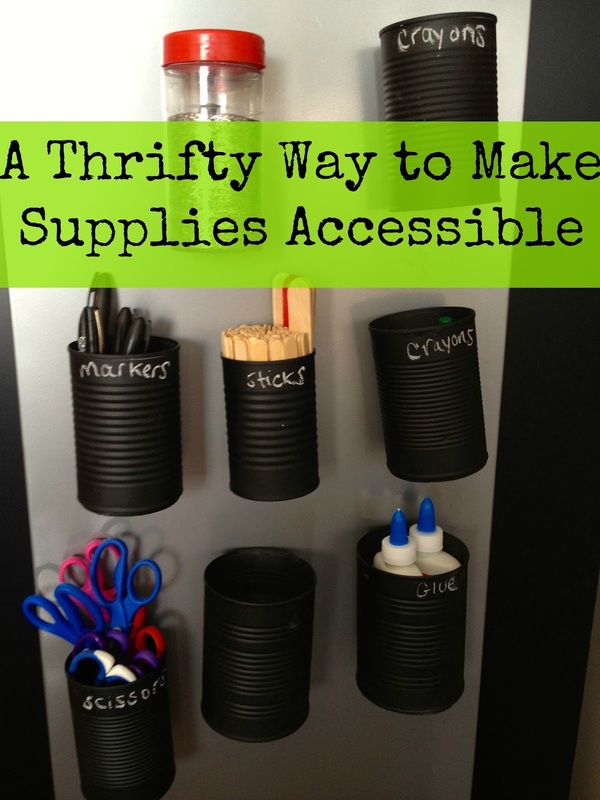 The result was that I ended up with a great way to make our family's frequently used craft supplies accessible to my kiddos, and it barely cost me a thing! 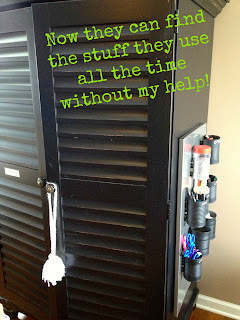 I found that more than just one magnet was needed to be able to load the cans with supplies and have them stick to the board without slipping. You can find magnets like these at craft stores like Michael's and Hobby Lobby (remember those weekly 40% off coupons). The idea worked out great. We attached the magnet board to the side of the armoire, and it's just so handy! Honestly, I myself love being able to grab a pair of scissors without even opening the cabinet. I love that My Little Reader can reach all the stuff he uses the most and take the crayons or markers over to the table to use whenever he wants without calling to me for help. And putting it all away is so easy, just stick them back on the board! These cans could also work great on a refrigerator! I still haven't decided what supplies will go in some of my cans. I might have a few that I rotate what's kept in them, kind of like we do with our toys. This way my kids can be surprised and inspired every week or so with some fun craft supplies that they forgot we even had! 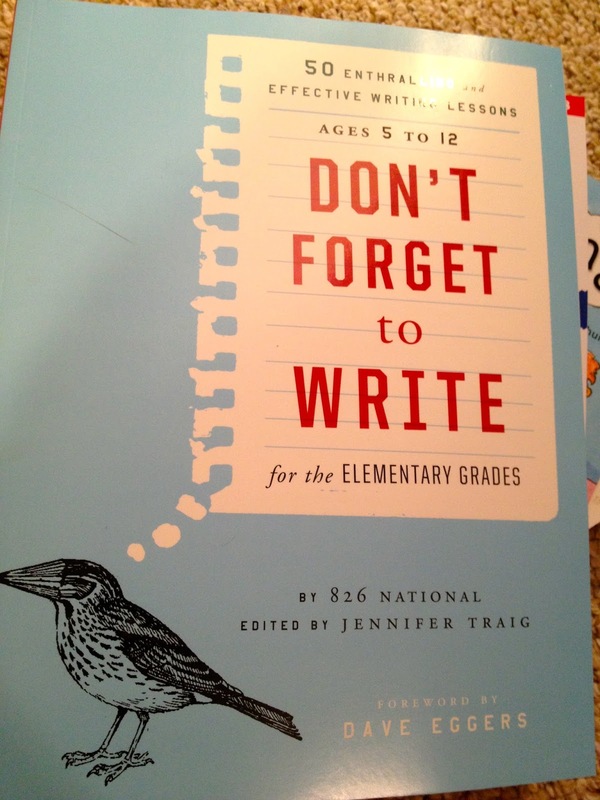 A good read often inspires a fun craft at our house. 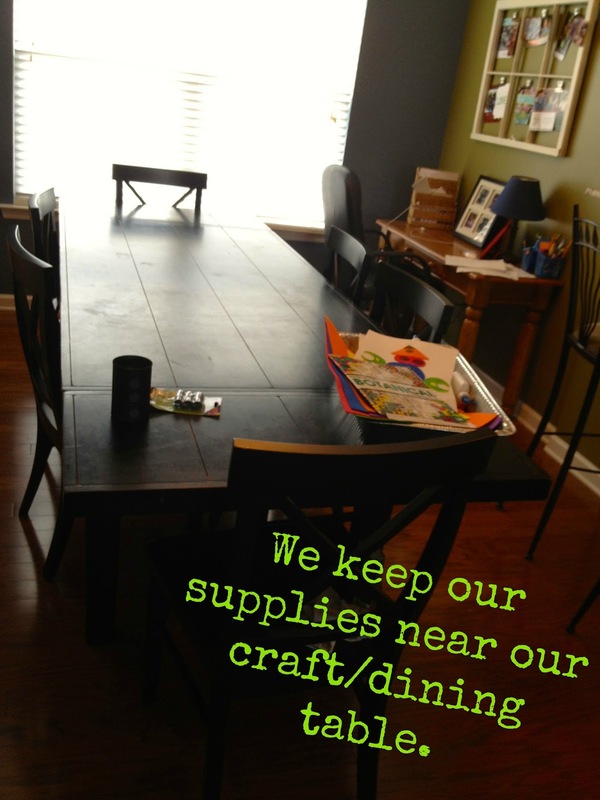 So I'm glad I found a way to make the crafting just a little bit easier for my kids!